I am so excited about my latest project! Yes, I know I always say that, but this one is one of my favorites! I was inspired a a photo that I found on Pinterest from a British home decor magazine. Isn’t it just so Christmas-y and festive? I love the simple, old-fashioned look! I found six flower pots that would fit my basket (more about it later) and filled each of them with some floral foam, cutting off the tops so that they would be flat. 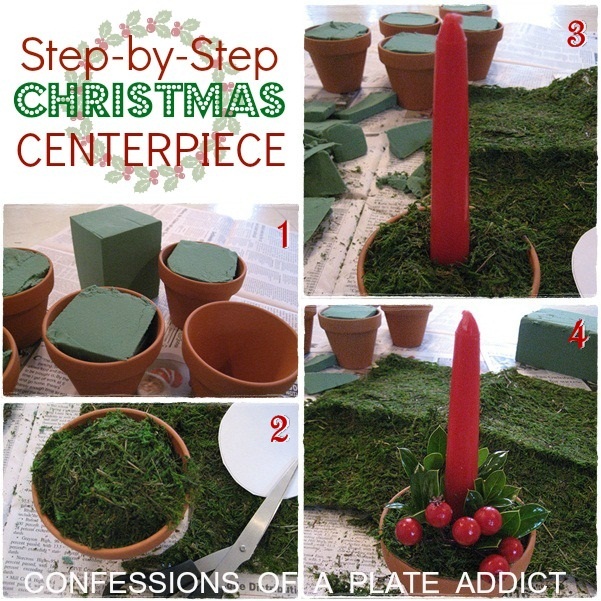 Next, I traced the top of the flower pot to use as a pattern and cut a circle for each pot out of a floral moss mat. The moss mat is less messy than just moss since it has a backing to help hold it in place and give it a shape. Then I tucked the moss circle over the foam. I used a knife to cut a slit in the moss mat and then turned the knife in the foam to create a hole. Then I added a candle to each pot. I used cuttings from my hollies in the yard and some faux berries to add some texture and color to each pot. Finally, I added a strip of the moss mat to each pot, tying it in place with jute twine. Almost finished! And…do you see my little co-host in the background? Miss Isabella decided that this project was just a little too messy for her, so she supervised from a distance! …taaa daaa! There you have it! I love the simplicity and natural look…perfect for my rustic burlap and plaid theme this Christmas! This is just a peek…I’ll show you more of the breakfast room (and the rest of the house) later! Plus I have a few little easy projects to share that you can finish up before Christmas arrives! I’d better hurry! Only two more weeks! Love, love, love this Debbie! I need to give this a try, so, so pretty! Great centerpiece and so adaptable to other sizes. I'm even thinking pastels for Easter! Love the basket and those little pots. Very cute idea. (: And it DOES look British! First of all, fabulous find on that basket, Debbie! It's a beautiful piece and I can imagine you will have a lot of fun using that to decorate with. Love this project! It makes for a really beautiful centerpiece. I love this! What a gorgeous centerpiece. Great pics of the creative process too. This is a beautiful centerpiece. Love the pictures. Great job as usual!! That looks so pretty Debbie! I love it! Your basket is fabulous! I have a similar look in a wooden French basket but think I may have to do.a bit if revamping today! Yours is lovely! What a beautiful centerpiece. Great job! Great job Deb, looks wonderful. I really love all the pops of red you are using this year. So cheerful and festive. Your home looks so warm and cozy, a perfect Christmas home! Ooh, so pretty! I love the basket, such a great deal! The candles and flower pots look so homey & elegant at the same time! Very pretty and refreshing. Happy Holidays! I liked so much the idea with the candles!Kisses to your furry helper! Love that basket and your centerpiece is beautiful. Thanks for sharing the tutorial! Messy or NOT. . .this is my kind of centerpiece!!! I adore how the flower pots fit nicely into your basket! I have some squares of moss that might be easier to cut. Fantastic idea...thanks for sharing!!! You always inspire me to attempt, anyway! P.S. I started those Christmas Stockings today...two down...two to go. I posted them on my FB page!!! Now that's something I can do. Looks good and your little tutorial sets a clear path. I've got a funny little terra cotta pot holder like that. I'm on my way out of the house and around the back where I keep the extra pots. Thanks for the clever centerpiece. What a great simple idea and not too much money involved. I saw this same centerpiece on Pinterest! Thanks for showing how to put it together, it looks great! Tres chic! And very festive! Plus, it fits my schedule and budget! Perfect! Come do my house now!!! It sure is a wonderful and festive look. I love it Debbie!!! Just lovely, Debbie. I have some metal baskets that I don't know what to do with and this is such a great idea. Love how you wrapped each pot with a strip of moss. Thank you for linking up to the Better Late Than Never Christmas Inspirations bloghop. This is so cute, and I think I have the perfect metal basket to copy your idea -- sorry! I think I might try doing something for winter look instead of Christmas at this point! Debbie- your blog always provides so much beautiful inspiration. Thanks for that! Glad that you linked up at the Better Late Than Never Party. Happy Holidays! As soon as I saw this photo, I had to click on it and read the post! I love this and would love to do the same thing. Thanks for the tutorial! Super cute! I've seen some little pots like these but this is the cutest yet! You put it together really nicely! Greenery with red candles, a perfect combination imo. Love how it turned out and Isabella keeping an eye from a distance. She looks a lot like one of our cats, Freckles.